The progressive overload principle is one of the most important training principles to understand. It is with a good understanding and execution of this principle that you will be able to pack on a lot of mass. Today I am going to explain my understanding of the progressive overload principle and how to properly execute it for maximum results. 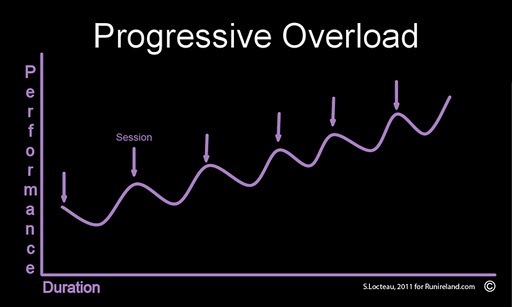 Progressive overload involves gradually increasing the stress on the muscle. This can be done in many different ways. In its simplest form, you could simply add more weight each time you complete an exercise. This causes an increase in the stress on the muscle. Another way to do this same thing is to increase the sets or repetitions. All three approaches will cause additional stress on the muscle which will help your muscles grow. By increasing the weight, repetitions or sets at each workout you will find that your muscles will begin to show an increase in size. They are forced to adapt to the stress you are putting them under. Periodization goes hand in hand with progressive overload. In fact, the chance are that if you are using progressive overload you are also using periodization. This is where you organize your training into periods of time. With a bodybuilder, this can be extremely important. The chances are that when you are on a very low carb diet for a period of months, lifting extremely heavy weights is going to be difficult. If you took the time to periodize your training to match your nutrition plan at the time you will see incredible results. You won’t see much success with progressive overload if you do not utilize a training log. The training log contains every workout you’ve completed and the exercises you used along with how many repetitions and sets you completed. By referring to a training log you will be able to program your workouts correctly based upon past performance. So tell me in the comments if you use a training log when you train. I want to hear the approach you use in the gym.